Stay up-to-date wtih all things OGDI by joining our Facebook group page. Jobs, announcements, campus engagement projects, news, all things UMD diversity and inclusion related, and other items are posted regularly. All are invited to join the OGDI Facebook group page. You can also follow OGDI on Twitter @OGDIUMD and Instagram @OGDIUMD and use hashtag #OGDI with all social media. 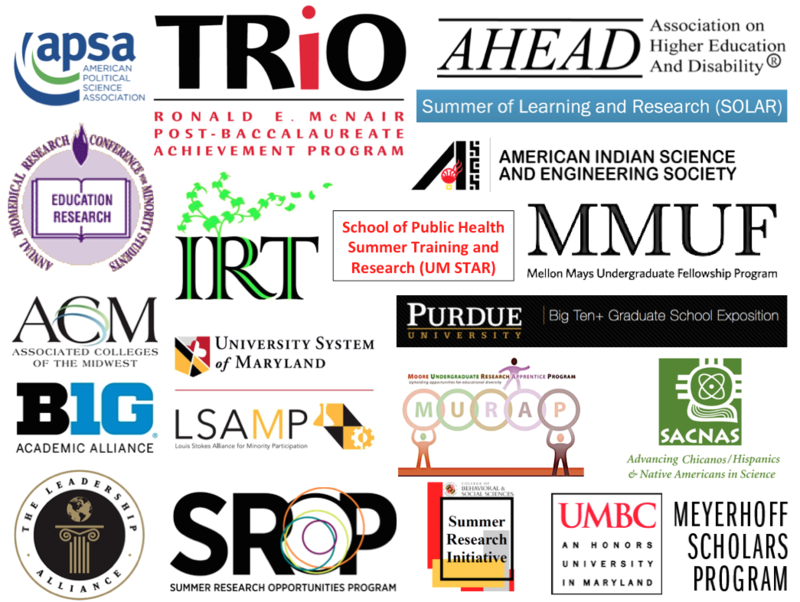 Funded by the National Science Foundation, PROMISE: Maryland’s Alliance for Graduate Education and the Professoriate (AGEP) is a university system-wide effort to increase the number of minority students receiving doctoral degrees and entering the professoriate in the fields of science, technology, engineering, and mathematics (STEM). Contact UMD PROMISE AGEP Coordinator Christopher Pérez (cperez6@umd.edu) to learn more about PROMISE activities at University of Maryland and system-wide institutions. As one of PROMISE’s founding partners, the University of Maryland coordinates several programs and activities in collaboration with the other founding partners, the University of Maryland, Baltimore, and the University of Maryland, Baltimore County. Beyond PROMISE AGEP programming, OGDI has also developed sustainable and signature programs that address diversity & inclusion in higher education, build communities of support and success, and create dialogues to advance graduate student experiences. OGDI's signature programs include "Cultivating Community Conversations" bi-monthly series, the "Annual Office of Graduate Diversity and Inclusion Spring Speaker Series," "Conversations on Graduate Diversity" series, and our "Diversity Board" Campus Engagement Project. Participants of the "Diversity Board" Campus Engagement Project are asked to 1) Tell us what diversity means to them, 2) Describe what diversity represents (some use images to express diversity), 3) Address what UMD does well to advance diversity initiatives, and/or 4) Promote ideas that further advance diversity initiatives to enhance inclusive excellence at UMD. All "Diversity Board" post-its are collected in a binder and travel to all campus engagement fairs as a mobile archive where all UMD undergraduate & graduate students, faculty, staff, and campus visitors connect, share, and advance diversity and inclusion initiatives. Through the Ronald E. McNair Graduate Fellowship Program, the Graduate School provides a select number of undergraduate McNair scholars who attend UMD for their graduate studies with an award that enhances the program's support package with an additional $40,000 over 4 years. Since the inauguration of the McNair Graduate Fellowship program, 36 exceptional students have been recruited to UMD. 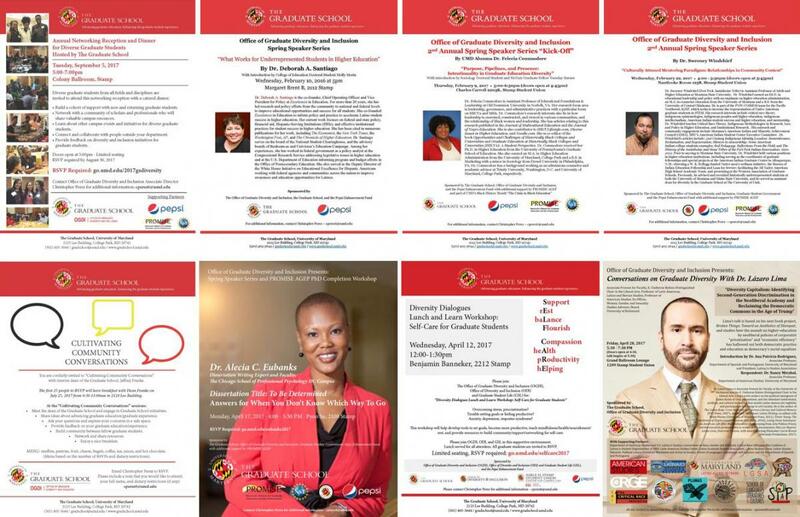 The Graduate School's Office of Graduate Diversity and Inclusion invites all Ronald E. McNair Postbaccalaureate Achievement Programs to visit UMD. Please contact Associate Director, Christopher Pérez (cperez6@umd.edu), to schedule a campus visit. Initiated in 1986 by the Graduate Deans of the Big Ten Academic Alliance, the Summer Research Opportunity Program (SROP) encourages talented, underrepresented undergraduates to pursue graduate study, and subsequently, academic careers. UMD’s College of Behavioral and Social Sciences (BSOS) and the School of Public Health (SPH) offer exciting summer research opportunities consistent with the SROP’s goal of increasing the number of those underrepresented in the sciences. To learn more about Summer Research Opportunities Program and how to apply, visit the Big Ten Academic Alliance SROP page and contact UMD SROP Coordinator Christopher Pérez (cperez6@umd.edu). The University of Maryland Graduate School also waives application fees to elegible students in participating programs. Click here to learn if you are elegible for an application fee wiaver and instructions to obtain an application fee waiver. 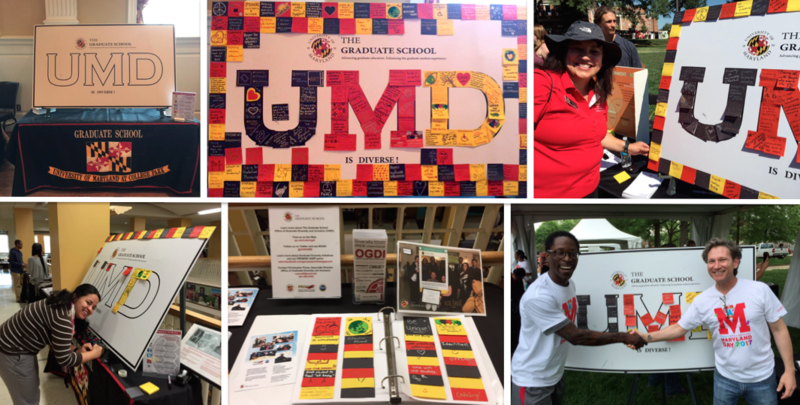 The Office of Graduate Diversity and Inclusion participates in many events to recruit underrepresented and underserved students to graduate programs at UMD. OGDI works closely with UMD faculty and program coordinators in its recruitment efforts. 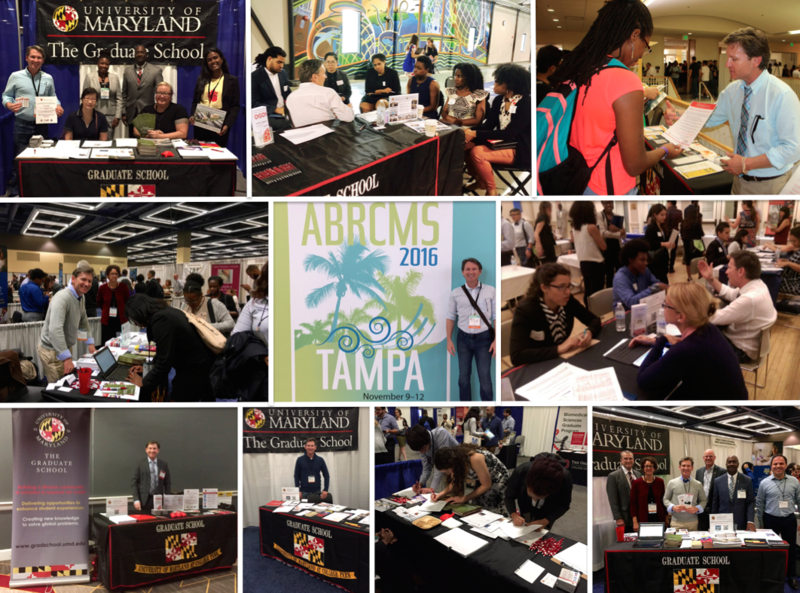 Big Ten Academic Alliance recruitment events include ABRCMS, SACNAS, Big 10/Expo (GEM Consortium), and SROP Coordinators Conference. OGDI is a co-sponsor of the BSOS Summer Research Initiative and UMD's Annual National McNair Conference held each year in March through UMD's Academic Achievement Programs. Other recruitment intiatives include the Institute for Recruitment of Teachers (IRT) through Phillips Academy, the National Name Exchange, NSF's Louis Stokes Alliances for Minority Participation (LSAMP) Program, and a pipeline infrastructure with McNair Programs, HBCU institutions, and The Universities at Shady Grove (USG). To learn more about recruitment initiatives, contact Associate Director and recruitment officer Christopher Pérez (cperez6@umd.edu). Preparing Universities at Shady Grove (USG) Students for Graduate Studies is a free program that provides USG undergraduates, post-baccalaureate students, and alumni with the knowledge and tools needed to prepare for graduate school, with the goal of increasing the number of underrepresented students applying to and enrolling in graduate school. 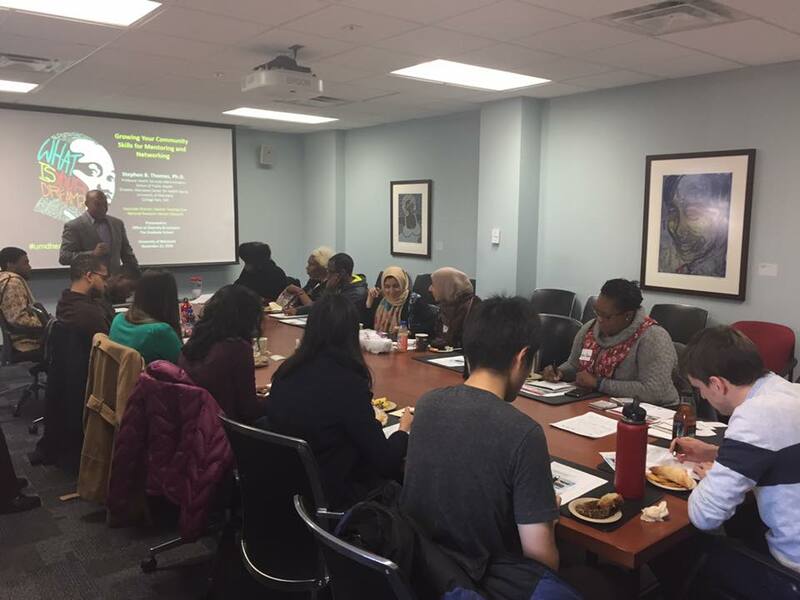 The program occurs weekly during the spring semester as a series of workshops led by administrators, faculty, and staff from University System of Maryland institutions. Workshop topics include the value of graduate education, the application process, funding, and test preparation. This program is supported by UMD’s Office of Diversity and Inclusion through a Moving Maryland Forward grant and co-hosted by the UMD Graduate School and USG’s Center for Academic Success. The “Spartners” community was created by the Graduate School in Fall 2015 to advance and support the needs of spouses and partners of doctoral students. Doctoral degrees transform lives, and earning one is an intense and lengthy process that challenges and rewards not only the doctoral candidate, but also the candidate’s spouse or partner. The Graduate School provides support to our “spartners” with annual activities including Orientation for Spouses and Partners of New Doctoral Students, workshops on work, life, & school, networking receptions, and friends & family of “spartners” summer potluck. 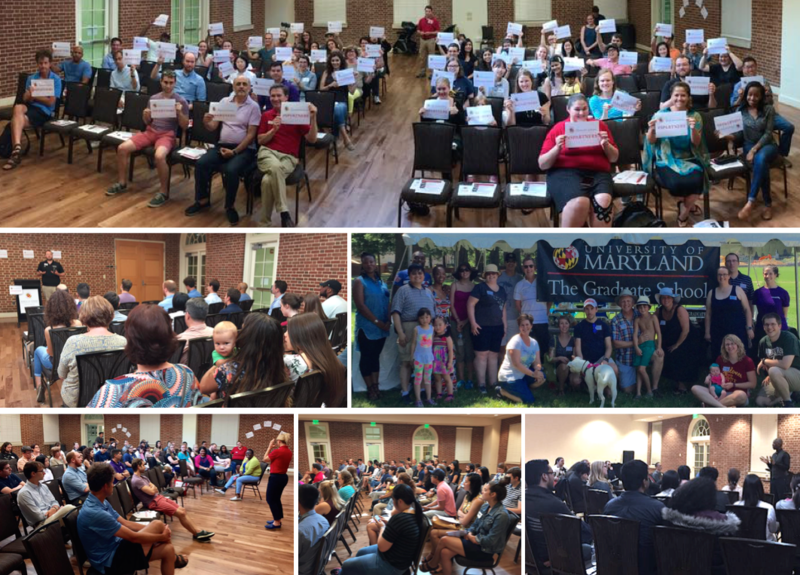 Please contact Associate Director, Christopher Pérez (cperez6@umd.edu), to learn more about our Spouses and Partners of Doctoral Students Community and check the Graduate School calendar for all "Spartner" events.